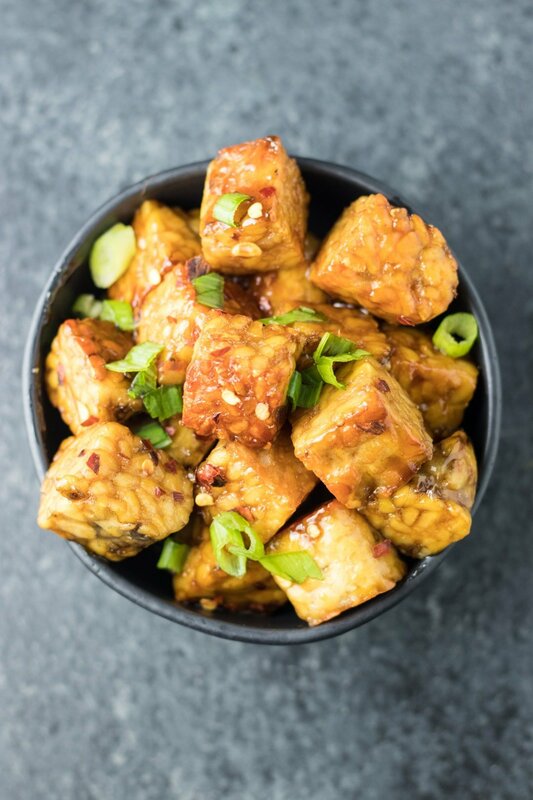 Low FODMAP Maple-Soy Glazed Tempeh – pan-fried tempeh is tossed in an Asian-inspired sweet and savory sauce to make a delicious plant-based protein option. Hey y’all! Have you tried tempeh? To be honest, I had never tried it until a couple of months ago. It’s quickly become a favorite source of plant-based protein. I first tried tempeh while at my yoga teacher training in Lembongan, Bali, Indonesia. I think it was only fitting that I tried it there for the first time because from my understanding, tempeh actually originated in Indonesia. Ginger and Jamu, the restaurant underneath our training, made a bunch of delicious side dishes that you could combine together to make really amazing whole food-based meals. As we were eating out every meal (accommodations with kitchens are pretty much unheard of in Lembongan), this build-your-own-meal option became a go-to. 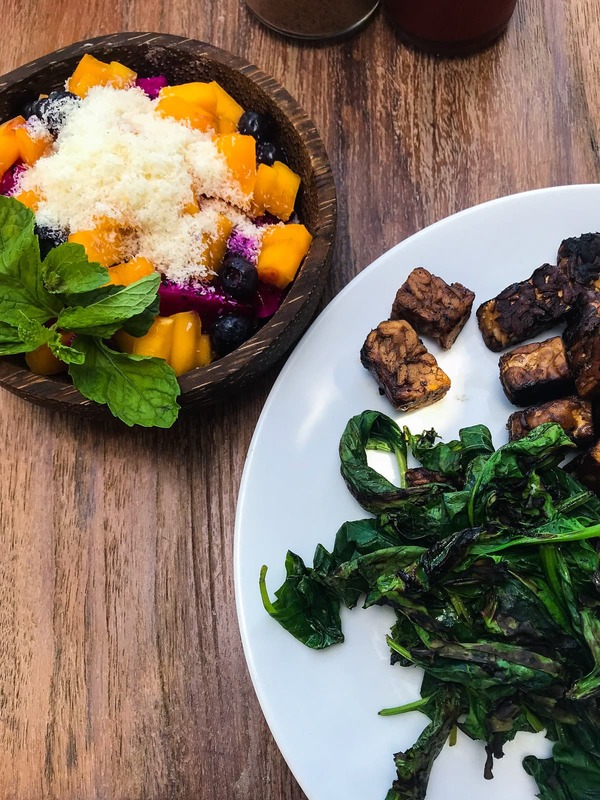 One of my favorite combos was their tempeh with sauteed local greens (with garlic – I’m okay with small amounts), and a side of tropical fruit (pictured above). Their tempeh was so good, I knew I wanted to bring tempeh into my lifestyle when I made it back home to the States. If you’re not familiar (like me a few months ago 🙂 ), tempeh is made from whole soybeans that are fermented and pressed together to form a block that you can slice or dice into whatever shape you’d like. 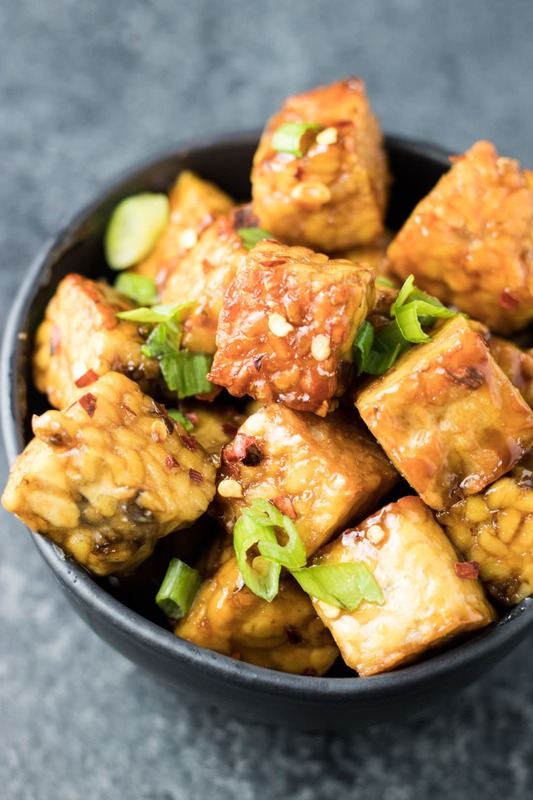 Tempeh is similar to tofu in that they’re both made from soy, they’re versatile, and they provide sources of plant-based protein. Aside from that, they’re pretty different. Tempeh has a savory, kind of nutty flavor. It also has a more “dense”, kind of chewy texture compared to tofu. If you’re looking to buy tempeh, I’d say most rural, small-town grocery stores likely won’t carry tempeh. I also haven’t seen it at Aldi yet. But you should definitely be able to find it at co-ops or natural foods stores. 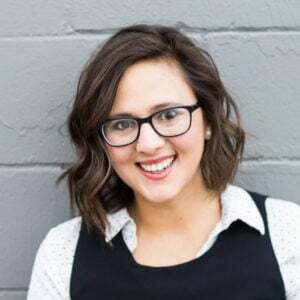 I’ve also seen more and more big-box grocery stores carry it either in their refrigerated “natural and organic” section or in the refrigerated section of their produce department. P.S. I’ve tried several different brands of tempeh and currently the one I like the most is Lightlife Soy Tempeh. It seems to crumble less than the others I’ve tried. Also, if you need to eat gluten-free, some tempeh may include gluten-containing ingredients, so double check the label. The Lightlife Soy Tempeh is made without gluten-containing ingredients but is not certified gluten-free. The glaze is sweet and savory and a little bit spicy (if you choose to use the red pepper flakes). I may be a little biased, but I think this is a really yummy way to enjoy some plant-based protein. My husband thinks this would be a good appetizer for a party – just stick some toothpicks in each piece and serve. However, I was thinking of this recipe as more an entree and think this tempeh is delicious with a side of steamed low FODMAP veggies (my fave is broccoli) and rice. In a small bowl, whisk together maple syrup, tamari, olive oil, ginger, and optional red pepper flakes. Set aside. Heat coconut oil in a large frying pan over medium-high heat. Once hot, add tempeh pieces and cook, flipping occasionally, until sides are browned. Remove cooked tempeh from pan and place on a plate lined with a paper towel. In the now empty pan, add sauce and cook over medium-high heat for 30 seconds to 1 minute, stirring constantly, until sauce starts to thicken. Remove from heat, add cooked tempeh and stir to coat. Top with optional sliced green onion (green part only) and serve immediately. 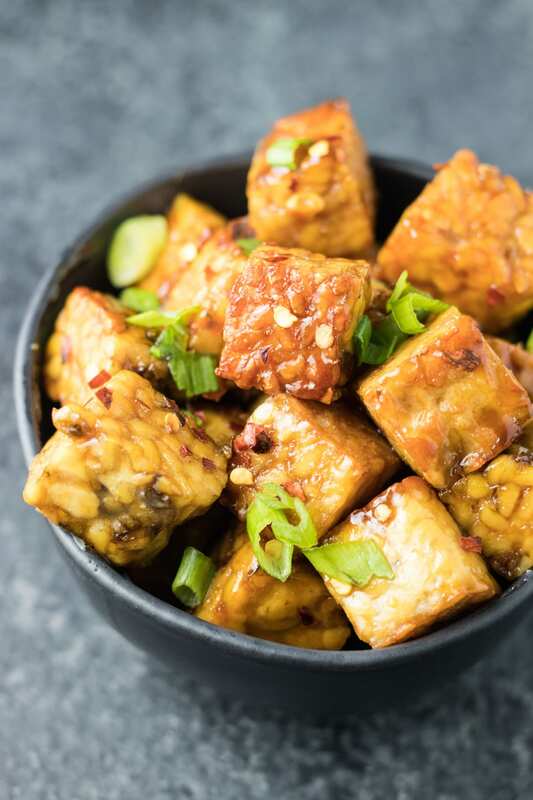 Tempeh: A low FODMAP serving size is 100 grams. 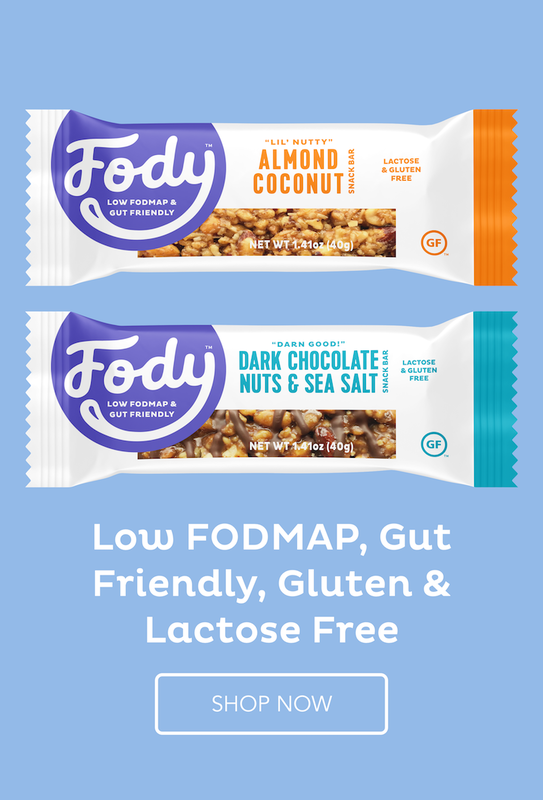 Double-check ingredients for no added high FODMAP ingredients. Also, not all tempeh is gluten-free. Serving Size: An 8 oz. package of tempeh equals 226 grams. To fall within the low FODMAP serving size recommended by Monash for tempeh, I have set the yield to three servings (approximately 75 grams of tempeh) for this recipe. Larger servings may be tolerated depending on individual tolerance level and what else this dish is served with. 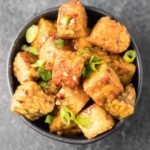 I love tofu and I would like to try this tempeh. This dish looks really delicious. Is tempeh available in any supermarket?